The Ireland Funds Japan (IFJ) was founded in 1993. It resulted from a meeting in Tokyo between The Ireland Funds’ Chairman Sir Anthony O’Reilly and his wife Lady O’Reilly and the founders of the Emerald Ball. Following the outstanding success of the first ball, Sir Anthony invited the group to join The Worldwide Ireland Funds. The Irish community in Japan, while small, exerts an influence beyond its sheer numbers. They are joined by a growing number of men and women of all ages who dedicate themselves to the study of Irish culture, arts and literature – from young Japanese students of Irish dance to literary and cultural groups of all ages, as well as Japanese who have fallen in love with the country after a single visit. The growing ranks of young Irish people who visit Japan for a study or work assignment and remain and marry into the Japanese community exert an additional sphere of influence. The number of Japanese companies with offices or manufacturing facilities in Ireland creates a link to the business community. Are you Irish or of Irish heritage living in Japan? Are you Japanese, or of any other nationality, who simply loves Ireland and enjoys Irish cultural events? Contact us to get involved. The inaugural “Emerald Ball” in March 1993, was attended by Their Imperial Highnesses Prince Akishino and Princess Kiko. 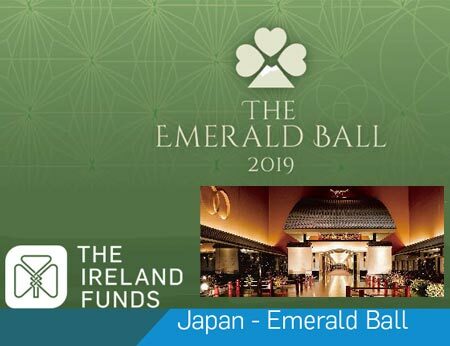 The annual Emerald Ball is a major social event for The Ireland Funds Japan. This gala evening showcases the best of Irish hospitality and culture and is a wonderful venue to entertain friends and special guests. Their Imperial Highnesses Prince and Princess Takamado have been guests at the Ball. The Irish reputation for mixing serious undertakings with enjoyable events extends to The Ireland Funds. The gala dinners, golf tournaments, and arts and cultural programs attract people from the highest levels of international business, politics and society. For example, The Canadian Prime Minister Brian Mulroney was at the Palm Beach Ireland FundsGala.HSH Prince Albert of Monacoattended a recent conference of The Ireland Funds in Wicklow. Former US President Bill Clinton received The Ireland Funds Peace Award. 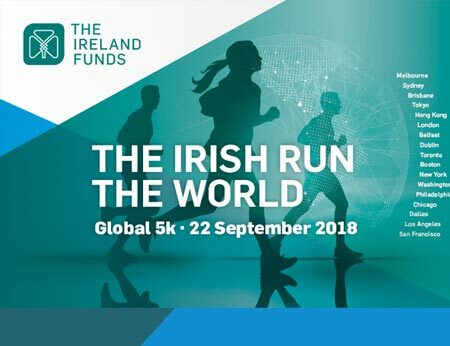 The Ireland Funds’ mission is to harness the power of a global philanthropic network of friends of Ireland to promote and support peace, culture, education and community development across the island of Ireland and among Irish communities around the world. Today, The Ireland Funds is one of the largest private sources of support for the Irish nonprofit sector. They have raised more than $550 million for the work of outstanding Irish charities. The Ireland Funds have supported projects that range from building a community center in Kobe after the 1995 earthquake to establishing Ireland’s first national music program which is now educating thousands of children. The Ireland Funds Japan plans an annual calendar of events based on aspects of Ireland of interest to its Japanese and international members – golfing, horse racing, fishing, sailing and arts and culture. The calendar will include general membership events and exclusive programs for special sponsors and supporters. The goal of the programs is to encourage greater cultural and communication links between Ireland and Japan. Funds raised from our events go to a range of projects. We are developing a program to involve Japanese and Irish companies and individuals in cultural, ecological, archeological, educational and community projects in Ireland and Japan—jointly and individually. A membership program with special benefits ranging from invitations to Irish arts and cultural events to exclusive travel and dining promotions and discounts is being developed. The work of The Ireland Funds Japan is made possible through the generosity of our sponsors and supporters. We offer companies and individuals a variety of sponsorship opportunities. Major sponsors receive prominent signage at the Emerald Ball event and in the Ball program in addition to other benefits. A Sponsorship Package is available outlining the alternatives available. The Sponsorship Program may be customized to meet your company’s specific needs.